In 2016 I had a wonderful opportunity to create the branding for a new florist opening in West Sussex. Becky contacted me having read my blog, and I was so excited to have my first ever commercial commission. Becky started her floristry company a few years earlier, however decided to dive in and open a shop in the South Downs Heritage Centre. We brainstormed for a while, and settled on sweet peas for the design. I was really excited about her choice. I love the delicate colours and the alien-like shapes the flowers form! As always I start with making my initial drawings from life. I made sure I mapped out the delicate veins, as I knew the flowers would fade fairly quickly, and the veins are important to give structure and dimension to the petals. My initial drawings always have as much detail as I can put in them. My next challenge is colour. To colour mix, I start by looking carefully at the specimen, and picking out every paint from my paint box that I can see in the flower, even in the smallest amounts. I then put these down on my paper. Then, I start to mix. I begin to work out which colour mixes match exactly, bearing in mind I like to, where possible, work with a limited palette. 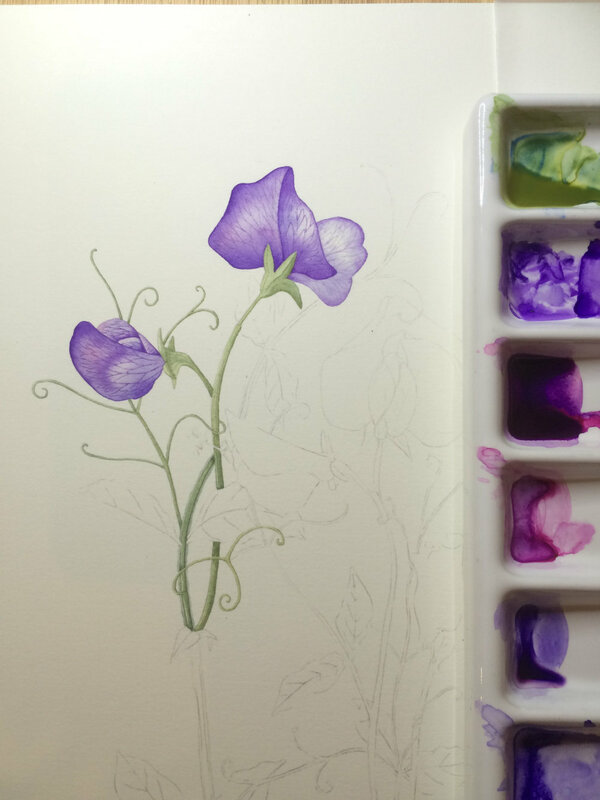 For example, the blue that I use in the purple on the flower I try and use in green of the foliage. I feel as though this gives the painting better unity at the end. Of course, sometimes it’s not possible. I hope the picture below demonstrates my process quite well. I actually painted these with a slightly different method to normal. Initially I tried painting the veins on top of washes and it just didn’t work, it didn’t look right. So, as you can see below, I actually started by painting in the veins first. Then, adding in the darkest areas of shadow. This meant that the veins appeared to be below the surface of the washes, and they became muted and blended into the rest of the flower. I found the composition planning for this piece pretty difficult. What you see below is only a very small snapshot of the process! I drew, re-drew, traced, copied, re-traced, asked a dozen people their opinions. It was by far the most time consuming part of the commission! I wanted something that looked natural. I sent Becky a few options to choose from and she liked the one that we finally settled on. Below you can see how Becky went on to use the design. I love the combination of the soft colours in the painting and the oak. I hope you've enjoyed reading around my process of completing this commission. If you have an idea about how we could collaborate, then do get in touch!